Ninth Moon Black has been introduced to me as a do-it-yourself hardworking band from the US Pacific Northwest with a unique sound. When you are going at it alone, and you are a fully instrumental entity rooted in the ambient atmospheric sludge, you have to be hardworking, you can’t just muck it up, pretend it to be artsy and hope for the best. A dedicated discerning audience is also a must, as a widespread recognition and rock-star status are unlikely to come by. Those committed fans, who I assume Ninth Moon Black have, are then very likely to determine how hard you worked and how far you have pushed the envelope. The opener Renascentia with its tom heartbeats and percussive cymbals is slowly feeling its way into a forest, speaking to life equal parts shimmering and mysterious. Not sure if this is quite unique and until guitars reached for a higher distorted note, it came off as an instrumental Agalloch more than anything. Beginning with Via Dolorosa however, the band is not afraid to step into it, dial up the bottom end and push its own brand of pensive sludge, both intricate and fleeting over some grumbling tremolo. Throughout Chronophage Ninth Moon Black managed to capture the feeling of all four nature’s elements. This album is not confined only to feeble airy moments. Bestia Devorat Tempus rolls on and pressurizes its riffs with earthy heaviness ratcheting the pressure till the very end. Mors Carnis is a fiery jazzy adventure, and reminded me of the Grayceon’s self-titled album without launching into that wild rumpus. Multipart monstrous Animus Lumino is watery, but not in the frail and delicate way. It is a tsunami beginning with a slow buildup of subterranean waves coming ashore, crashing off the deep end, growing shrill until one can’t take it anymore, revealing a darker side to the band. After Animus Lumino, the closer Numeratio is that welcome decompressive dissolution, the quiet after the storm, the warmdown after the quick race. With Numeratio, Chronophage turns its last page, sending the listener off to the dark room to sit there and relax, with his/her eyes closed, drifting into absentmindedness. Recommending this to the fans of the aforementioned Grayceon and Dark Castle, I found moments in Chronophage where my mind went along with the music, a good sign that the album was able to capture my senses. While I can’t quite say I remained captivated from start to finish, those entrancing moments were rather frequent and not few and far between. 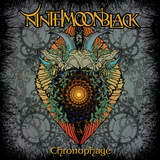 If you are into the thinking non-conformist psychedelic atmospheric sludge, you will do well to check out Chronophage. And then we can discuss my description of the nature’s elements assignment to the album pieces (as this review so weirdly turned into a boring track-by-track variety) or, alternatively, you can provide your own explanation to the Latin composition titles.